Michael Kugel was born in the USSR. He studied violin at the Beethoven School of Music and at the Music College in Kharkov, later he studied viola, composition and conducting at the Leningrad (St. Petersburg) State Rimsky-Korsakov Conservatory. In 1975 he won First Prize at the International Voila Competition in Budapest. In the USSR he was the soloist at the Moscow Philharmonic Organization «Mosconcert». Violist at the Beethoven State Quartet and assistant professor at the Moscow Tschaikovsky Conservatory. From 1990 till 1996 Michael Kugel was professor at the Jerusalem Rudin Academy of Music and Dance (Israel). In 1996 he settled in Belgium and now he is a professor at the Maastricht Royal Conservatory (Holland). Michael Kugel appeared as a soloist with many major orchestras and in major concert halls throughout the world. He has taken part in festivals and has given masterclasses in Europe, America, Asia and Far East. Michael Kugel has enriched the viola reprtoire with many transcriptions and his own compositions: Concerto for viola and orchestra, sonatas, duos, suites, preludes, etc. His compositions also include piano sonata, quartets, chamber symphony among others. They are published in Belgium, USA, Sweden and Ukraine. 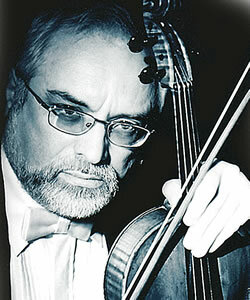 Michael Kugel was a member of jury for International Competitions in England. Germany, Italy, Austria, Israel, Belgium, USA, Croatia, Holland, Russia etc. He has recorded about 20 discs and also made numerous recordings as a conductor and viola d’amore performer. Michel Kugel is the author of three books: “Viola Sonata by Shostakovich and Viola Concerto by Bartok – The history of an era”, “Masterpieces of the instrumental music” and “Musical Essay”.